The Gritti Palace is one of the most refined and luxurious hotels in Venice, which is one of the most refined and luxurious cities cities in the world. Gritti chef Daniele Turco took us on a culinary tour of Venice as part of Chefs Travel week and also shared this (yes, refined and luxurious) recipe, which appeared in The Luxury Collection Epicurean Journeys cookbook. 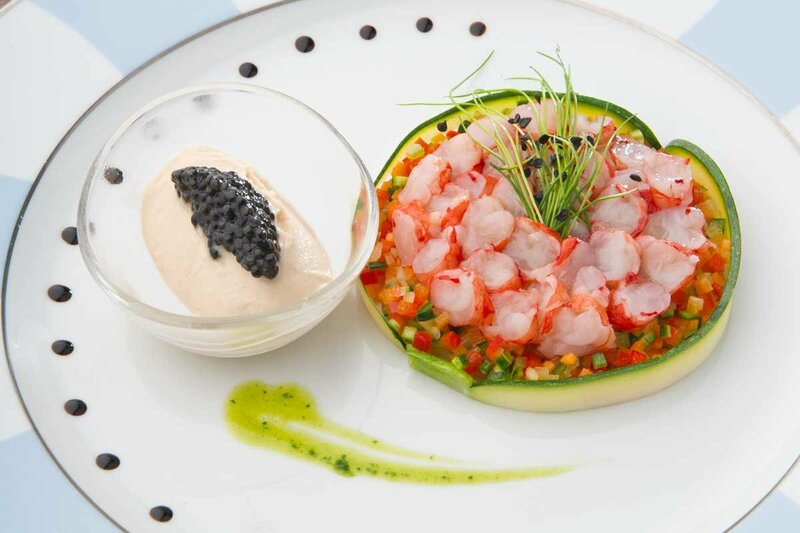 VENICE – The intention of this dish is to create a link between land and sea. All the ingredients are raw, enhancing their original characteristics. The extra virgin olive oil used here is from the Veneto region. Its character blends beautifully with the fresh seafood and vegetables. The ginger ice cream that completes the dish balances it and gives it a fresh, slightly spicy note. Whisk all the ingredients together well. Combine zucchini, cucumber, bell pepper, celery, and carrots. Toss with the citronette dressing. Place in the refrigerator and marinate overnight. Mix all the ingredients and cook over low heat, stirring frequently and carefully, scraping the bottom of the pan, until it reaches a temperature of 185° F on a candy thermometer. Remove from heat, strain, and cool to room temperature, whisking continuously over a bowl of ice. Place in freezer. Remove mixture when the edges start to freeze and churn vigorously with a fork, spoon, or electric hand mixer to break up the frozen parts. Place back in freezer and repeat this process two to three times until set. Peel shrimp, remove and discard the black vein, then slice them lengthwise very thinly. Arrange the marinated vegetables in a circle in the middle of each plate and dust the surface with a little salt and pepper. Arrange the slices of shrimp over the vegetables to form a spiral. Dress with olive oil, Maldon salt flakes, and freshly ground black pepper. Serve with a quenelle of ginger gelato and garnish with watercress. 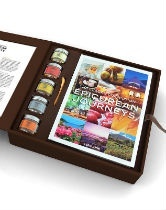 Buy The Luxury Collection: Epicurean Journeys, by Joshua D. Stein (Amazon). Reprinted by permission from The Luxury Collection: Epicurean Journeys, by Joshua D. Stein, Assouline Publishing 2014. Chef Daniele Turco is the Executive Chef of The Gritti Palace, a Luxury Collection Hotel in Venice, Italy, and also runs The Gritti Epicurean School. You can follow him on Instagram @thegrittipalace. He travels with his family to explore diverse environments and nature around the globe, and to discover new culinary trends and ingredients found in different parts of the world.